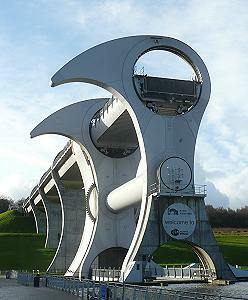 This series of photo-articles is a tribute to some fine engineering in Scotland. Most of this engineering is connected with water, one of Scotland's greatest assets. The UK's largest conventional hydroelectric power station, Sloy Power Station, is located on the bonnie banks of Loch Lomond, near Inveruglas. More.. It may come as a surprise that there are hydroelectric power stations on the Clyde, dating back to 1927, in areas not associated with mountains. More..
Leaderfoot Viaduct can be found in the Scottish Borders, near Melrose. This magnificent 19-arch structure allowed the Berwickshire railway to cross the River Tweed. More.. The Erskine Bridge is the last bridge on the Clyde before it reaches its estuary. More.. The Crinan Canal provides a shortcut across the Kintyre Peninsula in the West of Scotland between Ardishaig on Loch Fyne and Crinan in the Sound of Jura. More..
Lesmahagow has always been on the main route between Glasgow and Carlisle, from the times of the mail coach route to the motorway today. The river Nethan flows through Lesmahagow. Although it is not wide, it has carved out a considerable valley, so roads needed bridges to cross the Nethan and its valley. More..